Spring is here and it is time to start my tomato and pepper plants. This is an exciting time of the year for me as well as one that I will also dread in a few weeks. The process starts out with easy planting and ends with transporting my plant children in and out of safety to harden them off over a 12 day period. I have to say that seed starting is not for everyone. It sounds easy, buy a few pots, add a seed starting mix, throw in some seeds, water and put them in the window! Easy peasy! I don't want to discourage anyone but seed starting and growing is not always easy or successful and can be time consuming. That being said, with a little knowledge, you can be successful and reap the benefits of starting your own plants from seed. To me, as a life long gardener, planting a little seed, caring for it over a season and watching it grow into a large plant full of tomatoes or peppers always feels miraculous. Sometimes it is frustrating and disappointing when a garden jerk like a tomato horn worm eats your beloved plant or a strong wind storm blows something over, but the joy of eating tomatoes off of the vine that started as an idea in the middle of winter is amazing to me. To be a gardener you have to be an optimist that it will all work out! This year I am trying something different but first let me back up a little. 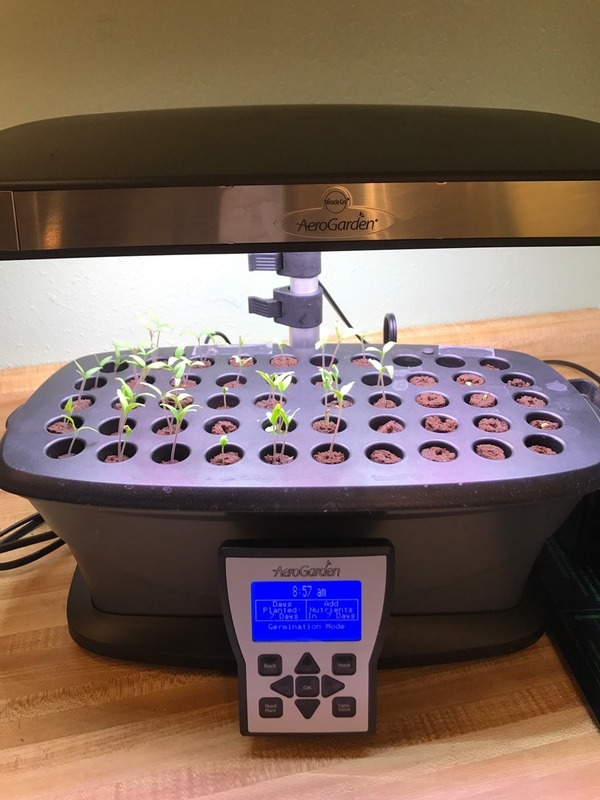 To be successful starting tomato and pepper seeds, you really need a full spectrum grow light and preferably a grow heat mat, both can be bought inexpensively on line or at a local store. There are various styles available or you can make one yourself. I have a light that I use on most occasions. Why the light and mat and not just a window sill? Seedlings innately grow towards light and if placed by a window they will lean toward the light and form skinny little vines and branches. By placing a grow light as close to the seedlings as possible, the plants do not have to reach towards the light. You can also control how long the light is on and during germination and early growth the light should be on 15-18 hours a day. A heat mat underneath the pots keep the little guys warm and they like that! Growth will be faster and the plants healthier. Back to my new plan this year. As I said before I purchased an Aerogarden (without a discount from the company) and saw the above seed tray in their catalog. The company caught me in a weak moment and I caved and bought one right away. I was going to order the seed tray with room for 31 starts but it was sold out and I bought the 50 start tray. Why not? The more the merrier, right? The only downfall at this time is that there is no place to add water without lifting the cover. I didn't realize this until I had planted the seeds and am hoping that one will not grow so that I can use a funnel to add water and nutrients through the seed tray. Do you like the map I drew of the started plants? I love the beginning of the season when I have a little extra time for organization! Just wait, as I get busy it will all go to hell and I'll end of planting the tomatoes and forgetting to make a map or I'll leave the map in the garden and it will rain... I always try to do better next season and maybe this will be the year seeing that i started so great! 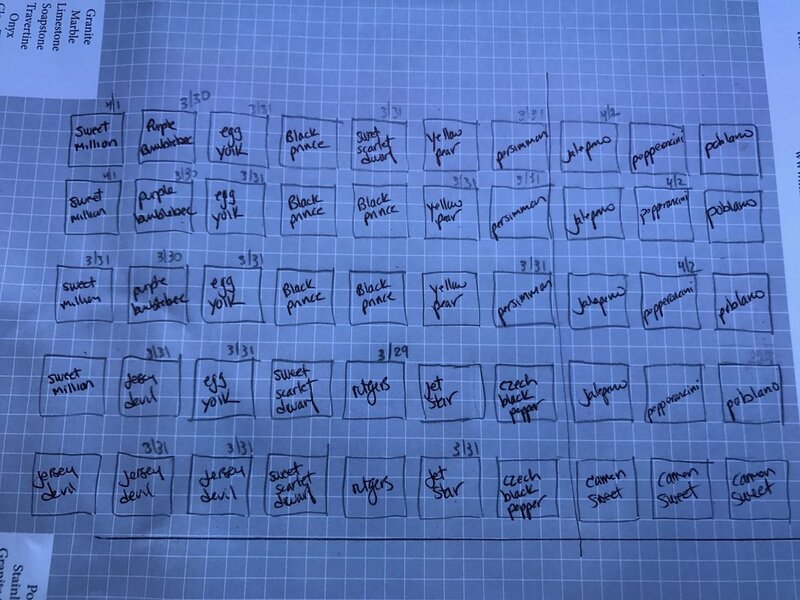 Anyways, the three rows on the right are all peppers and I expect that they will be slower and take longer to be ready to transplant. I'm curious to see how they do, the overhead light is not very warm and the basement is kept cool most of the time. The Egg Yolk tomato sprouted first, I have high hopes for this new tomato variety! I learned this winter that fragile plants enjoy the full sprectrum light that the Aerogarden gives off. With this in mind I placed a heat mat next to the Aerogarden and started some lettuce and a few more fragile annual flowers. Initially I covered the containers with plastic wrap to heat them up. The lettuce will quickly be moved to my other grow light, usually the heated mat can be too much for them. I did start lettuce upstairs in a plastic portable greenhouse and the sun from the window and the heat mat scalded them and lead to their desmise. Lesson learned, AGAIN! Time to go, only 36 days until the last frost!